Marbled murrelets and their old-growth forest nesting habitat in the Pacific Northwest remain protected, thanks to a successful court challenge by the Center for Biological Diversity. A Washington, D.C. district court rejected both a proposal to eliminate all critical habitat protections and a direct challenge to protection of the marbled murrelet as a threatened species. The lawsuit is the timber industry’s third attempt in the past decade to eliminate murrelet protections, despite undisputed scientific evidence that murrelets are disappearing from the coasts of Washington, Oregon, and California. Last summer the U.S. 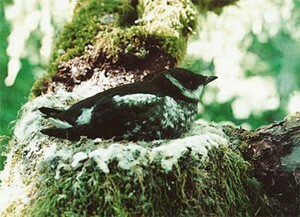 Fish and Wildlife Service settled with the American Forest Resource Council, a timber industry group, to avoid a legal battle over maps of protected areas for the marbled murrelet. The government agency agreed to suspend protections for about five years while it drew better maps. The Center for Biological Diversity challenged that settlement, arguing that five years was too long to leave the bird unprotected from irresponsible timber harvest practices. The battle is not over. The Audubon Society of Portland, Seattle Audubon Society, Center for Biological Diversity, Conservation NW, Environmental Protection Information Center, Oregon Wild, and Sierra Club are defending the murrelet in the timber industry lawsuit. Birders, Can you identify these PNW bird nests?